You might debate the food/energy/water nexus. You can’t debate the food/energy nexus I saw Friday night in Malden, Massachusetts. A thousand high school kids and their community created a huge amount of energy about food. That energy is being channeled to help launch an innovative experiment in using private means for public ends. Returning from South Africa a few weeks ago I described that country as a sustainability laboratory. This weekend in a high school gym I discovered that Malden, Massachusetts, is a sustainability laboratory, too. Who knew? What happened in Malden this weekend? The event: Malden High School held its third annual Multicultural Celebration. The event was driven by the school’s Multicultural Club whose purpose applies to the event as well: “We celebrate the myriad of cultures and backgrounds in Malden, and we strive to educate and inform students about those cultures as a way to further encourage unity and understanding in our society and community.” Faculty liaison Yahaira Marquez and her students put on an amazing event, bringing together cultures through music and food in a way that I can only describe as joyful. Words don’t capture it as well as pictures, though. Take a look at the pictures on Facebook to get a better feel for the event. 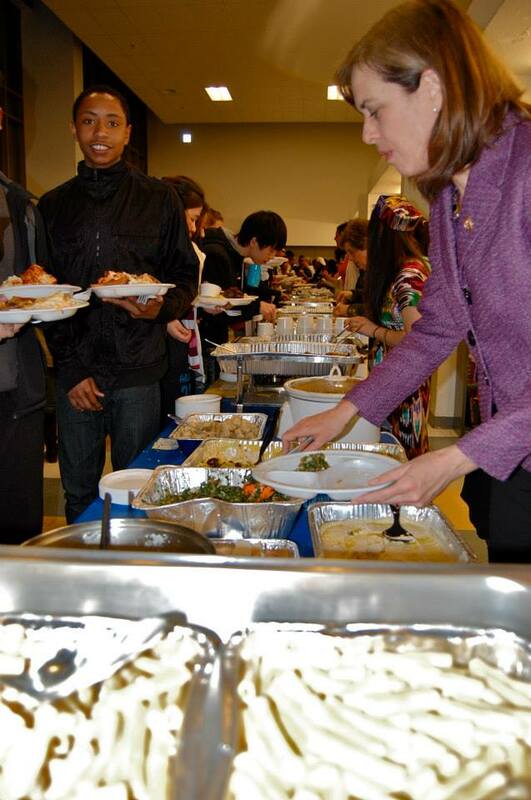 The launch: In partnership with the MHS Multicultural Club, Stock Pot Malden launched this weekend. Stock Pot Malden is a “…test to prove that delicious and culturally diverse food + world-class business training for entrepreneurs + empowering every culture and community = good and lucrative business.” This test aims at answering the eloquent question: “If diversity is valuable, why aren’t we seeing millions of dollars directed toward it?” In partnership with MHS, Stock Pot Malden ran an International Top Chef Cooking Competition at the event, bringing added energy and excitement. The following morning, two overlapping circles of project participants met. One circle was Malden-focused, and includes locally-based managers and food experts. The other circle included investors and advisors, some local but others from Chicago, New Hampshire and Italy. The two circles worked as one group, fueled by the energy from the prior evening’s event but ruthlessly focused on the operational and financial realities. There were no roles. Nobody was limited in what they could ask or answer. We were all just partners, trying to co-create a successful private enterprise with public values. None of us know for sure where this is going to go. That’s why it’s a laboratory. But it’s starting to feel less like the laboratory of some mad scientist and more like a promising R&D venture. Stay tuned. Follow Stock Pot Malden on Facebook or Twitter. And watch for more of the public-private conversation here on my blog. Congratulations to you and the team that got this launched. I’m inspired reading about it and can only imagine what actually being there might have been like. I wish you all the best of luck as this public / private laboratory begins to really hum. I look forward to more updates. In my new field of design, I find that these business principles of value are often lost amongst those interested in public values, if not 99% of all designers. In that way, I’m able to bring something ‘new’ to the conversation from my former life in consulting. I draw from your insights and the insights of your peers / mentors in this conversation. Thanks for sharing the way you do and offering at least a quirky alternative to the status quo. Keeps it fun. I look forward to contributing to the conversation as a co-conspirator / creator in this idea of private enterprise with public values as I design my next endeavors in the coming months / years.